Turkish President Tayyip Erdogan meets with Russia's President VladimirÊPutin at the Presidential Palace in Ankara, Turkey, September 28, 2017. 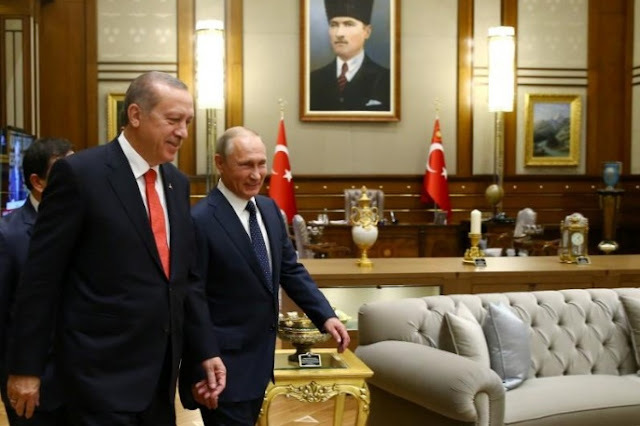 MOSCOW - Russian President Vladimir Putin and Turkish President Tayyip Erdogan discussed an upcoming meeting of the Astana process on the Syrian conflict in the Kazakh capital in late October, the Kremlin said on Saturday. During their phone conversation, Putin and Erdogan talked about joint efforts within the Astana process, including the creation of “de-escalation zones” in Syria, and further coordination towards resolving the Syria situation, the Kremlin said in a statement. The Astana talks are brokered by Russia, Turkey and Iran. In mid-September, the three countries agreed to post observers on the edge of a de-escalation zone in northern Syria’s Idlib region largely controlled by Islamist militants. “Overall, the conversation was business-like and constructive, directed at strengthening bilateral cooperation and interaction on the regional agenda,” the Kremlin said.